Warner Bros. Television makes another exciting return to New York Comic Con (NYCC) with three new eagerly anticipated series, including Gotham (Mondays, 8/7c on FOX), Forever (Tuesdays, 10/9c on ABC), and Constantine (Fridays 10/9c, on NBC), in addition to returning hits The Following (Midseason on FOX) and Person of Interest (Tuesdays, 10/9c on CBS). 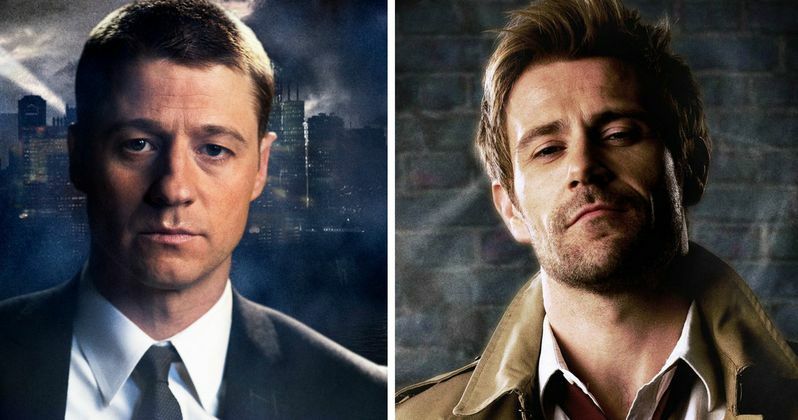 Confirmed to attend New York Comic Con 2014 for panel sessions with fans include Constantine stars Matt Ryan and Angélica Celaya, along with executive producer David S. Goyer; Gotham stars Ben McKenzie, Sean Pertwee, Robin Lord Taylor and Erin Richards; Forever stars Ioan Gruffudd and Alana De La Garza, along with executive producer Matthew Miller; The Following's Kevin Bacon, Shawn Ashmore and executive producer Marcos Siega; Person of Interest's James Caviezel, Michael Emerson, Amy Acker and Kevin Chapman, along with executive producer Greg Plageman. For the second year at NYCC, Warner Bros. Television will host preview night screenings in the Main Stage on Thursday, October 9. Fans will not only view the complete pilot episode of the hotly anticipated series Constantine (series premiere Friday, October 24, 10/9c on NBC), but also the Season 2 premiere episode of The 100 (Season 2 premiere Wednesday, October 22 9/8c on The CW) will be screened. Thursday, October 9 - Main Stage • 8:30 p.m.
John Constantine is a man waging war against the forces of darkness -from both within himself and the outside world. An irreverent, working-class con man and occult expert, he's an experienced exorcist and demonologist with an extensive list of supernatural contacts, each with their own paranormal talents and abilities. Following the aftermath of a tragic incident, Constantine has voluntarily checked himself into an asylum and sworn off investigating matters of the supernatural, but when a cryptic message calls him out to reluctantly resume his old life, he finds himself saving the life of a young woman whom he's never met but is connected to in a very important way. With dark forces gathering power in the world, Constantine allies himself with Manny, a rogue warrior angel, and his giant childhood protector, Chas-the only friend who's managed to stay alive. Based on characters published by DC Entertainment, Constantine reflects the lore of the fan-favorite comic, combining noirish storytelling with the evolving mythology of John Constantine, a morally challenged character who doesn't come down on the side of either good or evil...but ultimately might be the only thing defending us against the dark forces from beyond. The series stars Matt Ryan (Criminal Minds: Suspect Behavior), Angélica Celaya (Dallas), Harold Perrineau (Lost), and Charles Halford (True Detective) and is executive produced by Daniel Cerone (Dexter) and David S. Goyer (The Dark Knight trilogy). From Bonanza Productions Inc. in association with Warner Bros. Television, Constantine will air Fridays at 10/9c on NBC, premiering October 24. Season 1 of The 100 saw the human race return, after a 97-year exile in space, to a wildly transformed Earth...only to discover that the human race had never truly left. Clarke found herself forced to lead a band of disposable juvenile delinquents as they faced death at every turn: from a world transformed by radiation, from the fierce Grounders who somehow managed to survive in it, and, perhaps worst of all, from themselves. Meanwhile, as The 100 fought for their lives on the ground, The Ark's situation was no better. Both on the ground and in space, the final episodes revealed the true desperation of their plight, as our heroes risked everything just to stay alive. Noble sacrifices and heartbreaking choices changed everyone forever, and left them scattered to the wind at season's end. The epic second season picks up with the group still scattered and desperate to be reunited. As members of The 100 and new arrivals from the Ark stake out their place in a dangerous and beautiful new world, they are confronted with the physical peril and moral dilemmas that come with reforging society. What kind of life will they build? And what will it cost them? This season's quest will challenge them more than anything that's come before. Hearts will be broken. Lives will be lost. Heroes will be born. From Bonanza Productions Inc. in association with Alloy Entertainment and Warner Bros. Television, The 100 returns Wednesday, October 22 at 9/8c on The CW. John Constantine is a man waging war against the forces of darkness - from both within himself and the outside world. An irreverent, working-class con man and occult expert, he's an experienced exorcist and demonologist with an extensive list of supernatural contacts, each with their own paranormal talents and abilities. Based upon characters published by DC Entertainment, Constantine reflects the lore of the fan-favorite comic, combining noirish storytelling with the evolving mythology of John Constantine, a morally challenged character who doesn't come down on the side of either good or evil ... but ultimately might be the only thing defending us against the dark forces from beyond. Attendees will see a screening of the complete pilot, followed by a Q&A with series stars Matt Ryan (Criminal Minds: Suspect Behavior), Angélica Celaya (Dallas) and executive producer David S. Goyer (The Dark Knight trilogy). From Bonanza Productions Inc. in association with Warner Bros. Television, Constantine will air Fridays at 10/9c on NBC this fall, premiering October 24th. Become a fan on Facebook at Facebook.com/Constantine and follow the show on Twitter at @NBCConstantine. Hit thriller The Following returns to New York Comic-Con for its third year in a row. Join executive producer Marcos Siega along with series stars Kevin Bacon and Shawn Ashmore for an onstage Q&A and special video presentation. With Joe Carroll once again behind bars, Lily Gray shot in cold blood by Mike Weston, and Luke dead at the hands of Max Hardy, Ryan Hardy's conviction to forge a new life will be put to the test in the psychologically intense third season, when a new threat emerges from the shadows, proving to be even more insidious and dangerous than his former archenemy, Joe Carroll. From Bonanza Productions Inc. in association with Outerbanks Entertainment and Warner Bros. Television, The Following's third season premieres midseason on Fox. Become a fan on Facebook at Facebook.com/TheFollowing and follow the show on Twitter at @TheFollowingFOX. Before there was Batman, there was Gotham. The origin story of the great DC Comics Super-Villains and vigilantes,Gotham will follow Det. James Gordon's rise through the Gotham City police department. Everyone knows the name. But what is known of Gordon's rise from rookie detective to Police Commissioner? Discover the never-before-told story of how Gordon navigated the layers of corruption that secretly ruled Gotham City, the spawning ground of the world's most iconic villains - the larger-than-life personas who would become Catwoman, The Penguin, The Riddler, Two-Face and The Joker. Join series stars Ben McKenzie, Sean Pertwee, Robin Lord Taylor and Erin Richards, along with executive producers for a special video presentation and Q&A discussion. From Warner Bros. Television, Gotham airs Mondays at 8/7c on FOX. Become a fan on Facebook at Facebook.com/GothamonFox, and follow the show on Twitter at @Gotham. What would you do if you had all the time in the world? This new otherworldly drama follows Dr. Henry Morgan, a star New York City medical examiner, on his journey to answer that looming question. Henry, who hasn't aged since the clock stopped 200 years ago, has a bit of a vested interest in studying the dead: He is immortal, and only his best friend and confidant, Abe knows Henry's secret. Join series stars Ioan Gruffudd and Alana De La Garza, along with executive producer Matthew Miller for a special video presentation and Q&A discussion. From Warner Bros. Television in association with Lin Pictures, Forever airs Tuesdays at 10/9c on ABC. Become a fan on Facebook at Facebook.com/ForeverOnABC and follow the show on Twitter at @ForeverABC.